Orville Oliver PRICE "Jr" [Parents] was born on 6 Jan 1931 in Greenbrier Twp, Faukner, Arkansas. He died on 2 Jul 1985 in St. Petersburg, Pinella, Florida. He was buried in Veteran's Cemetery, Cheltenham, Prince George's, Maryland. Orville married Lillian Sylva DECKER before 1948. Lillian Sylva DECKER. Lillian married Orville Oliver PRICE "Jr" before 1948. Clarence Martin GURWELL. Clarence married Clara Lucene MYNEAR on 2 May 1982 in , Pawnee, Oklahoma. Clara Lucene MYNEAR [Parents] was born on 4 May 1915 in Morrison, Noble, Oklahoma. She died on 23 Apr 2003 in Pawnee, Pawnee, Oklahoma. She was buried on 26 Apr 2003 in Highland Cemetery, Pawnee, Pawnee, Oklahoma. Clara married Clarence Martin GURWELL on 2 May 1982 in , Pawnee, Oklahoma. William Grant DUNCAN was born on 6 Mar 1863 in Dallas Twp, Taylor, Iowa. He died on 26 Jun 1949 in Pawnee, Pawnee, Oklahoma. William married Fannie Rosetta GARNER on 20 Mar 1892 in Bedford, Taylor, Iowa. Fannie Rosetta GARNER was born in Dec 1863 in Bedford, Taylor, Iowa. She died in 1946. Fannie married William Grant DUNCAN on 20 Mar 1892 in Bedford, Taylor, Iowa. M i Harve DUNCAN was born on 30 Nov 1907. He died on 30 Jan 1972. Waldean BEAVER was born on 2 Jun 1904 in Council Grove, Morris, Kansas. He died on 8 Jan 1999 in Pawnee, Pawnee, Oklahoma. Waldean married Mabel F. DRAKE. Mabel F. DRAKE was born about 1905. Mabel married Waldean BEAVER. F i Eno Juanita BEAVER was born on 12 May 1930. She died on 19 Jul 1999. Charles W. BARNETT was born on 3 Nov 1881 in , , Kentucky. Charles married May D. in 1906. May D. was born on 19 Mar 1884 in , , Arkansas. She died on 15 Nov 1969. May married Charles W. BARNETT in 1906. M i William Dotson BARNETT was born on 12 Nov 1914. He died on 9 Dec 1994. Wenford James STRAIN was born on 2 Aug 1928 in Featherston, Pittsburg, Oklahoma. He died on 5 Feb 1983 in Veteran's Administration Medical Center, Muskogee, Muskogee, Oklahoma. He was buried on 7 Feb 1983 in Mountain Home Cemetery, South of Whitefield, Haskell, Oklahoma. Wenford married Bobbie Kathryn "Kay" SPEARS on 11 Jun 1952. Bobbie Kathryn "Kay" SPEARS [Parents] was born on 3 Apr 1934 in Stigler, Haskell, Oklahoma. She died on 15 Feb 1988 in McAlester, Pittsburg, Oklahoma. She was buried on 18 Feb 1988 in Mountain Home Cemetery, South of Whitefield, Haskell, Oklahoma. Bobbie married Wenford James STRAIN on 11 Jun 1952. Ricky Lee STRAIN was born on 16 Mar 1953 in McAlester, Pittsburg, Oklahoma. He died on 17 Apr 1953 in A McAlester Hospital, Pittsburg, Oklahoma. He was buried on 18 Apr 1953 in Mountain Home Cemetery, South of Whitefield, Haskell, Oklahoma. Bobby Ray SPEARS [Parents] was born on 28 Aug 1935 in Wright City, McCurtain, Oklahoma. He died on 17 Oct 2004 in McCurtain Memorial Hospital, Idabel, McCurtain, Oklahoma. He was buried on 21 Oct 2004 in Slater Cemetery, Wright City, McCurtain, Oklahoma. Bobby married Imogene. Imogene. Imogene married Bobby Ray SPEARS. 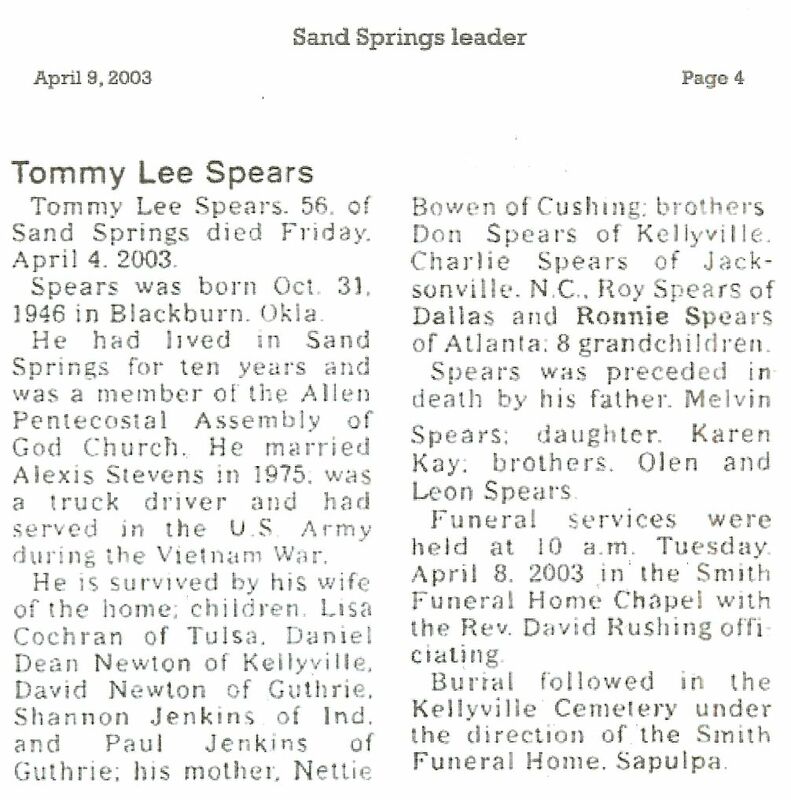 Tommy Lee SPEARS [Parents] was born on 31 Oct 1946 in Blackburn, Pawnee, Oklahoma. He died on 4 Apr 2003. He was buried on 8 Apr 2003 in Kellyville Cemeterym, Kellyville, Creek, Oklahoma. Tommy married Alexis Mae STEVENS on 7 Mar 1975. Alexis Mae STEVENS was born on 28 Jul 1944. 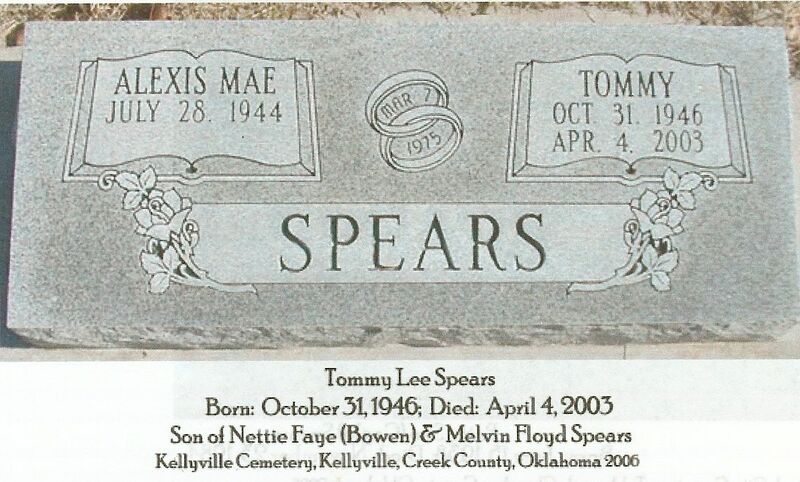 Alexis married Tommy Lee SPEARS on 7 Mar 1975. David Thomas RUNYAN was born in May 1869 in , , Arkansas. David married Julia SINNICKSON before 1893. Julia SINNICKSON was born about 1874. She died before 1900. Julia married David Thomas RUNYAN before 1893. F i Rose Lee RUNYAN was born on 17 Dec 1894. She died on 20 May 1991. John David TWIST [Parents] was born on 26 Jan 1920 in , , Oklahoma. John married Velma HUGHES before 1946. Velma HUGHES. Velma married John David TWIST before 1946.